ARRIGO. On March 11, EDGAR, aged 70, passed away peacefully comforted by the rites of Holy Church. He leaves to mourn his loss his beloved wife Alice, his daughters Anita and her husband Robert Grech, Julia and her husband Mark Valentino, his sons Simon and his wife Stephanie, Mark and his partner Rebecca, his treasured grandchildren Luke, Benji and baby Emma to whom he was a much loved nonno, his brother George and his wife Lorraine, in-laws, nephews, nieces, cousins, other relatives and friends. The funeral cortège will leave Mater Dei on Friday, March 22, at 8.30am for St Julian’s parish church where mass præsente cadevere will be said at 9am followed by internment at Santa Maria Addolorata cemetery. Lord, grant him eternal rest. ATTARD. On March 19, at Mater Dei Hospital, RITA, widow of Alfred, of Santa Venera, aged 81, passed peacefully away, comforted by the rites of the Holy Church. She leaves to mourn her loss her daughter Brigitte and her husband Clive, her son Simon and his partner Yasmin, her beloved grandchildren Dorian and his wife Cecilia, Michela, Marco and his mother Daniela, her brothers, in-laws, their respective spouses, nephews and nieces, relatives and friends. The funeral leaves Mater Dei Hospital tomorrow, Thursday, March 21, at 1.45pm for St Cajetan parish church, Ħamrun, where Mass praesente cadavere will be said at 2.30pm, followed by interment in the family grave at Santa Maria Addolorata Cemetery. Lord grant her eternal rest. BORG. On March 19, at Mater Dei Hospital, DAME MARIA ADALGIZA of Żebbuġ, residing in Attard, aged 80, passed away surrounded by loved ones. She leaves to mourn her loss her husband Alfred, her son Joseph and wife Sandra, her daughter Isabel, and son Gordon and partner Clare, her granddaughter Francesca and partner Carl and great-granddaughter Kate, her grandsons Matthew, Luke and Gabriel and granddaughter Sara-Ann, her brother and sisters, relatives and friends. 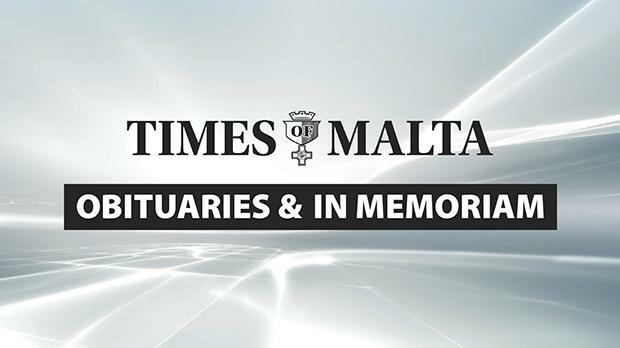 The funeral leaves Mater Dei Hospital on Thursday, March 21, at 1.30pm, for Attard Parish Church, where Mass will be celebrated at 2pm, followed by interment in the family grave at Santa Maria Addolorata Cemetery. Donations at Urusline Sisters Sliema will be greatly appreciated. No black attire is to be worn. Lord, grant her eternal rest and peace. CASSAR. On October 20, EDWARD, of Sliema and residing in Wardija, aged 66, passed away peacefully comforted by the rites of the Holy Church. He leaves to mourn his loss, his son Sean and his wife Amanda, his mother Jane, his brothers and sisters Albert, Anna, Tony, Henry, Richard and Vicky, their respective spouses, his nephews and nieces, other relatives and friends. The funeral leaves Mater Dei Friday, March 22, at 1.30pm, for the Saint John of the Cross Parish Church, Ta’ Xbiex where Mass præsente cadavere will be said at 2pm, followed by interment at Santa Marija Addolorat Cemetry in the family Chapel. No flowers by request but donations to Id-Dar tal-Providenza Siġġiewi will be greatly aprreciated. Lord, grant him eternal rest. LA FERLA. On March 17, at Mater Dei Hospital, FLORENCE, aged 75, passed away peacefully. She leaves to mourn her loss her brother George, Frank and his wife Roslyn, their daughter Beverly and her husband Philip and their children Isobel and Eleanor, their son Nigel and his girlfriend Evelin, her sister-in-law May, her niece Carol and her husband Adrian and children Andrew and Alistair, cousins and friends. Mass praesente cadavere will be said today, Wednesday, March 20, at 2pm at the Addolorata Cemetery chapel, followed by interment at the back of the church. MICALLEF. On March 19, JOSEPHINE, from Żurrieq, residing in San Ġwann, passed away peacefully, aged 80, comforted by the rites of Holy Church. She leaves to mourn her loss her husband Joseph, her children Simone and Ivan, her brothers and sisters, Eileen, widow of her brother Edgar, Sister Antonia of the Sacred Heart, Catherine and her husband Anthony Buttigieg, Louis and his wife Doris, Charles and his wife Rita, Anna and her husband Freddie Agius, Carmen and her husband Twanny Scicluna, her in-laws and their spouses, nephews and nieces, other relatives and friends. The funeral cortege leaves Mater Dei Hospital tomorrow, Thursday, March 21, at 1.45pm, for San Ġwann parish church, where Mass præsente cadavere will be said at 2pm, followed by interment in the family grave at the Santa Maria Addolorata Cemetery. No flowers by request but donations to Radio Maria are welcome. Lord, grant her eternal rest. BORG – PAUL. Treasured memories of a dear father, today being the 54th anniversary of his death. Always in our hearts, thoughts and prayers. Never forgotten, always remembered with love and affection by his daughter Jane Testaferrata Moroni Viani and his son Tony and his wife Maria, and their respective families, his grandchildren and great-grandchildren. Lord, grant him eternal rest. Tomorrow’s 8.30am Mass at St John of the Cross parish church, Ta’ Xbiex, will be offered for the repose of his soul. A prayer is kindly solicited. DIACONO. In loving memory of Maestro FRANKY DIACONO, today being the 19th anniversary of his death. Fondly remembered by his daughter Stella and her husband George, his grand-children Maria, Manolis, Franky and their families. Lord, grant him eternal rest. ENGERER – GRACE, née Felice. Cherished and beloved memories of a very dear mother and grandmother called to eternal life 22 years ago today. Always in our thoughts and prayers. David and Joan, and grandsons Zachary, Bernie and Jonathan. ROSSI – ANNE. Treasured and unfading memories of a most beloved mother, today the third anniversary of her demise. So sadly missed, so dearly loved. Albert and Stephanie, Ernest and Doreen, Margaret and Louis, Stephen and their families. Lord, grant her eternal rest. VELLA – GODFREY. Treasured memories of a beloved husband, father and grandfather on the 21st anniversary of his death. Sadly missed and fondly re-membered by Lucienne, Marylene, Stephen and Alexia.